For courses in first-year composition. The most balanced coverage of the writing process, grammar, research, and other issues important to today’s students. 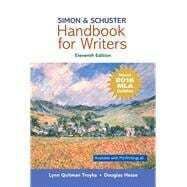 Perfect for students seeking support at any stage of the writing process, Simon & Schuster Handbook for Writers , Eleventh Edition continues its emphasis on critical thinking and reading as fundamental skills, integral to quality writing and sound research practices. Trusted authors Lynn Troyka and Doug Hesse provide everything that composition students need — how to write college papers, use and document sources, write online, write with visuals, master grammar, and use correct punctuation. Designed for easy use and speedy entry into all topics, this book welcomes students into a conversation about becoming better writers. Lynn Quitman Troyka, Adjunct Professor of English in the MA Program in Language and Literature at the City College (CCNY) of the City University of New York (CUNY), taught freshman English and basic writing for many years at Queensborough Community College. Dr. Troyka is a past chair of the Conference on College Composition and Communication (CCCC); the College Section of the National Council of Teachers of English (NCTE); and the Writing Division of the Modern Language Association (MLA). She has won many awards for teaching, scholarship, and service, and has conducted hundreds of faculty workshops about teaching writing and its relation to college-level reading. Doug Hesse is Professor of English and Executive Director of Writing at the University of Denver, one of only thirty writing programs to receive the CCCC Certificate of Excellence. Dr. Hesse is a past chair of the CCCC, the nation’s largest association of college writing instructors. A past president, as well, of the Council of Writing Program Administrators (WPA), Dr. Hesse edited WPA: Writing Program Administration. He has served on the NCTE executive committee, chaired the MLA Division on Teaching as a Profession, and served on the MLA Committee on Contingent Labor. Author of nearly sixty articles and book chapters, he has been named University Distinguished Scholar at the University of Denver.